By simply entering your web service credentials you can setup Currency Load to retrieve foreign currency rates from any web service of your choice. Loading currency rates from the web is quick and simple with one click manual loading or use automatic loading. 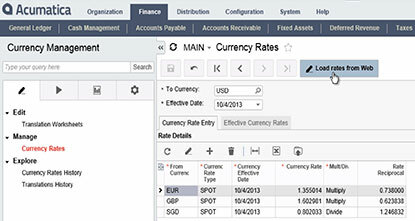 With one click, you can instantly load foreign currency rates into Acumatica from the web service of your choice or schedule an automatic update of currency rates for a no hassle process. With Currency Load for Acumatica all you need to do is enter a web service URL, authentication code and default rate type then you are ready to go!